In 12-inch nonstick skillet, heat turkey and salt to taste over medium-high heat until no longer pink. Add remaining ingredients except cheese; stir to combine. Spread in baking dish. Top with cheese. Spray piece of foil large enough to cover baking dish with cooking spray. Cover baking dish with foil, sprayed side down. 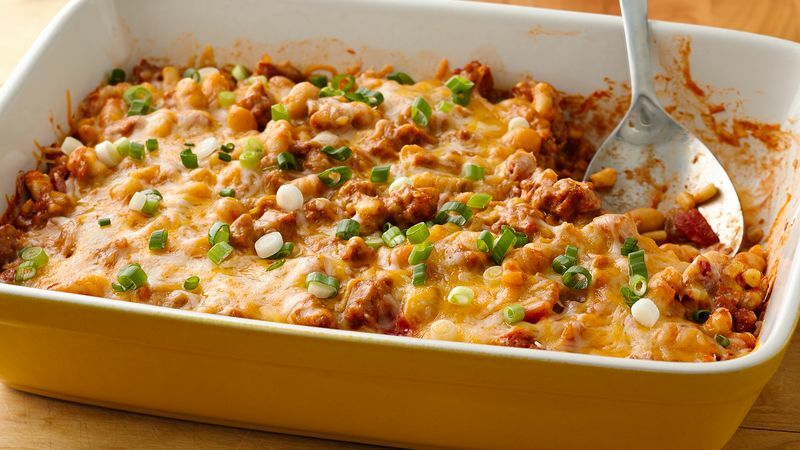 Bake 40 to 45 minutes or until instant-read thermometer inserted in center of casserole reads 165°F. If desired, serve over rice with favorite chili toppings: cilantro, green onions, sour cream, yogurt, salsa, guacamole. To freeze: Spray 2 (8-inch) disposable foil cake pans with cooking spray. After covering pans with sprayed foil, place pans in gallon-size resealable freezer plastic bags, or wrap in double layer of plastic wrap. Label and freeze. To bake: Thaw overnight in refrigerator. Heat oven to 350°F. Remove from plastic, and place foil-covered pans on cookie sheet. Bake 40 to 50 minutes. If baking from frozen, bake 1 1/4 to 1 1/2 hours. Spicy tomatillo salsa makes a nice substitute for the Thick 'n Chunky salsa, if you can take the heat. Shave off even more prep time by using 2 cups shredded deli rotisserie chicken in place of the ground turkey.